Traveling has forced me to pre-schedule most of my recent posts and read but not comment on some of your great blogs.....sorry! Hope my posts weren't too boring. 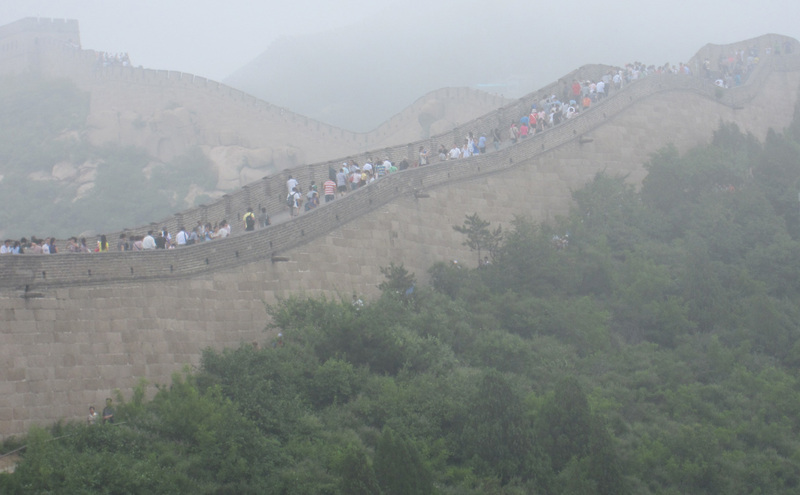 I just returned from a trip to China and had just enough time to unpack and re-pack my suitcase for a trip to Honolulu to attend my son's four cousins graduation party. 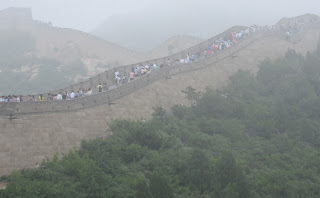 China was hot and crowded but the shopping bargains were fantastic! 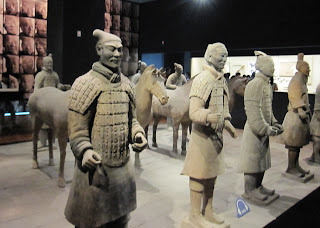 Beijing, Xian, and Shanghai were more modern than I expected. (See photo.) The trip really brought history to life and made me appreciate the sophistication of the Chinese culture........and the shopping was fantastic!!!! Returning home made me glad to live in Hawaii because of the weather, clean air, open spaces, and easy lifestyle. The cousins' graduation party was a great success. Knowing that I would be too tired from my China trip to do a decent job on party favors or decorations, I suggested we do a candy bar so the guests could help themselves. My sister-in-laws who live in Honolulu did a terrific job of setting up the table of goodies, arranging the room, picking the menu, and planning a program. Thanks Ann and Lynn! I know that I don't really need more paper but I can never resist looking at the latest that DCWV has to offer. I absolutely had to get the mariposa pack.....absolutely magnificent and it matches wonderfully with all the new flowers and butterflies filling the shelves at Ben Franklin Crafts. Don't you just love the little tin of tiny glittered flowers? Of course you can punch out and glitter your own flowers but they are so teeny tiny and tedious to make yourself. The single butterfly is a Sizzlet die which is the perfect size for making card embellishments. DCWV also has glitter paper pads that coordinate with their printed line and of course the packs come in the large 12x12 size too. I forgot to photograph the stickers I found which matches the Safari paper. If you need to make album pages or cards for boys, the Safari designs will make you happy. I was so pleased with the animal print paper that I may finally finish our San Diego Zoo scrapbook pages. When did we take those photos 2002? Even more importantly, if the pictures were not digital where did I put those photos????? Even though Christmas is months away , I had to buy this tool set......for myself! LOL I have lots of jewelry tools but they are a hodge podge of tools I purchased over the years. Some are cheap quality and a few are antiques so I thought that it was about time I bought myself a good quality complete jewelry tool set. 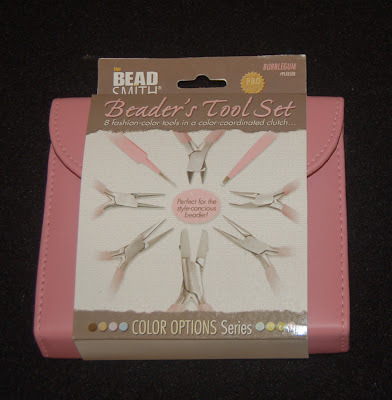 I know that Bead Smith makes quality products and this set was in my favorite color, PINK so it was sold as soon as I saw it. 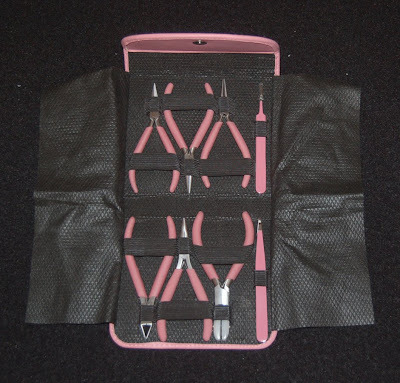 This full set of tools comes in other pretty colors too including a lovely light teal. If you are a new jewelry maker or someone who's always needed a complete set, this is a reasonable investment for you. Go ahead, treat yourself to something that will make crafting a pleasure and soon I know that you'll be making some really fine jewelry. While I had all my baby stamps and embossing folders out, I decided to create a baby card, too. You can't really see the embossed vellum, but it was made in the Sizzix embossing folder and has the word 'baby' and flowers all over it. I love the delicate, sheer look, sort of like dotted swiss material that was popular when I was young......that does date me doesn't it? The three squares are stamp designs from an old Hero Arts set. All the images and words are stamped on white card stock, colored, cut out, and adhered with foam dots. 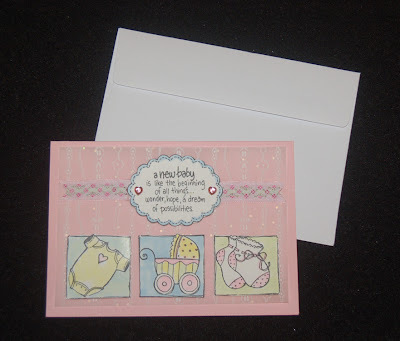 I think the Stampendous rubber stamp saying is exactly the right message to send to new parents. Before cleaning my stamps, I made a sheet of images to color and cut out later when I need another baby card. I store the extra images with the matching rubber stamps. This is a good habit to form and it will speed up the next card/album page production. I'm glad you stopped by for a quick visit and I hope you'll find the time to read my blog again in the future. I wanted to help Carin get a head start on this baby album but I didn't want to actually do the pages because I think the photos and journaling are the most important part and that has to be done by the mom-to-be. Anyway, I thought that a few stickers, embellishments, labels and printed album pages might be a good beginning. Pictured here are just four of the clear album pockets that I filled. The first page is actually my shower card (my message is attached to the ribbon and hidden behind the dark pink circle). The blue rectangle is for a sonogram photo or a photo of the mom's belly. Kids love to see what it was like before they were born. I also left the top of the rectangle open so Carin could include a personal note to the baby expressing what she was thinking about during her pregnancy. The rest of the pages are not really laid out but generally have a theme and color scheme. If you know someone special who is having a baby, this is a fun gift to put together and will give the recipient something to work on while waiting for the BIG day. Once the baby is born, the new mom might be lucky and have a baby that sleeps regularly so she can continue the album.......yeah, that's a real fantasy! Carin, if you get the album finished before the baby goes to college, you'll be more efficient than me. 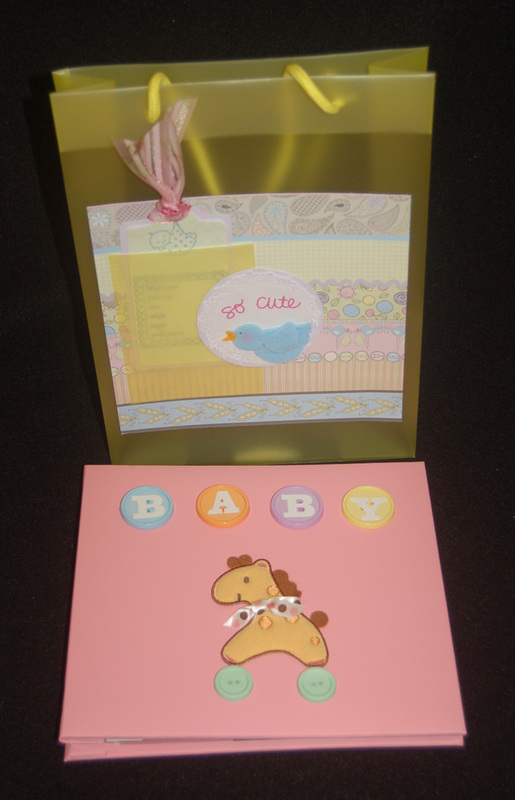 I wanted to make a baby album as a shower gift for our dear Carin in the Craft Club office. (We couldn't handle the craft club membership cards without her.) As usual I didn't come up with an idea until just before I needed to give her a gift (before the baby arrives). The Mrs. Grossman album was plain pink (yes, it's a girl!) so I just had to fancy it up. 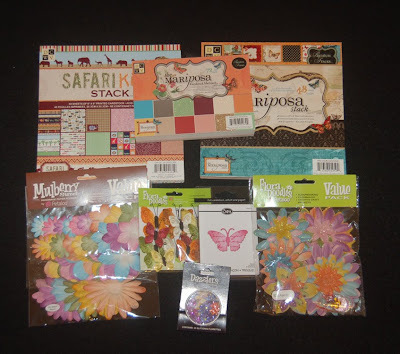 Looking at every possibility at Ben Franklin Crafts, I finally settled on an adorable giraffee applique and Blumenthal big pack of pastel buttons. Don't you just love the giant buttons? I found some fuzzy letter stickers in my alphabet drawer (doesn't everyone have one?) which fit on the buttons perfectly. I tied a dotty ribbon around the giraffee's neck and used Fabri-Tac glue to stick everything down. The simplicity of the album seems to suit a newborn baby. The yellow bag in the background is one that I made and showed on a previous blog post. The decorated page on the gift bag can be removed and placed in the album. I hope that Carin will work on this album because I know that I regret not being more diligent with my sons' albums. My husband says I'm like a cobbler (not the fruit dessert) with no shoes. When did my boys grow up? I must have been sleeping. I KNOW I wasn't cleaning my house! Remembeer in my last post I mentioned that Ben Franklin Crafts is carrying lots of new sweet treat themed products. One of the prettiest new items is the Nicole Crafts line of cupcake and treat boxes. 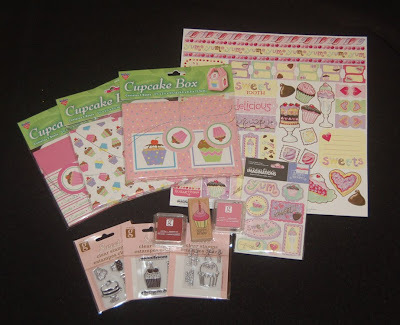 I think that the single cupcake boxes would be ideal to pack with the Studio G cupcake rubber stamps, inks, and clear stamp blocks. A dieting friend would appreciate a calorie free sweet gift and your budget will love the price of Studio G products $1.25......amazing! 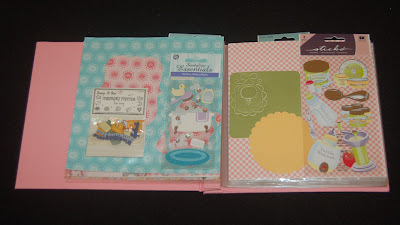 Studio G also has cupcake stationery, mousepads, notecard sets, and notepads......all priced at 4 for $5. Also with a yummy product line is Creative Imaginations. The 12x12 sheet in the photo is filled with easy to punch out cardstock tags, journaling pieces, tabs, and labels. 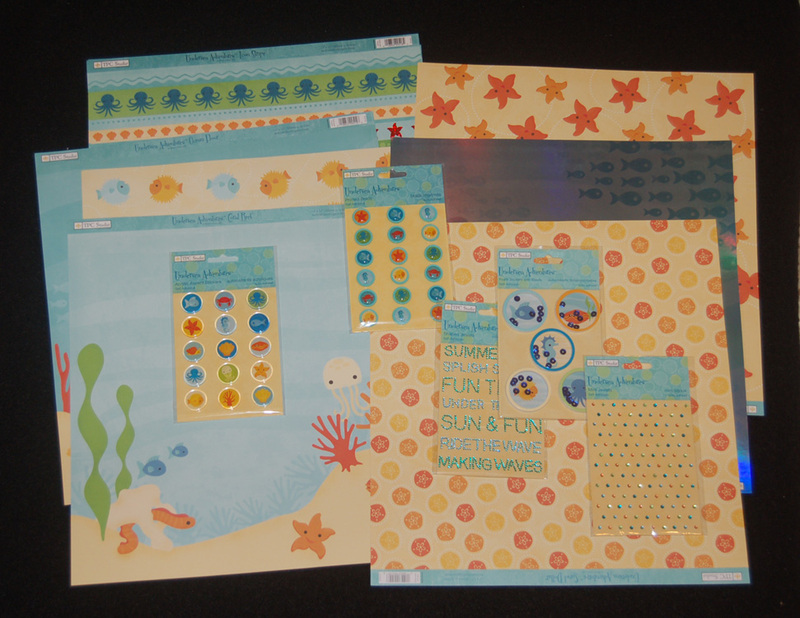 I also purchased the matching dimensional sticker set....too cute to pass up. Weightwatching and non-baking crafters will have fun playing with these products because they are sweet treats that require no cooking and have no calories! Just when I thought that I had all the dies and embossers that I could possibly want, Sizzix of course comes up with new, enticing ones that I just couldn't resist. 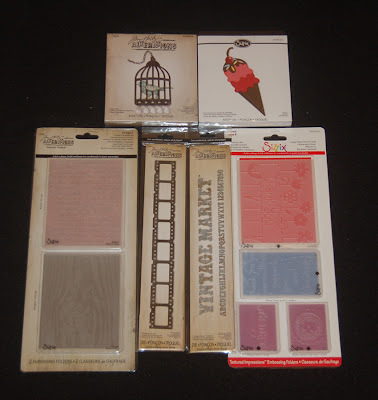 I absolutely love the line of Tim Holtz Sizzix products. 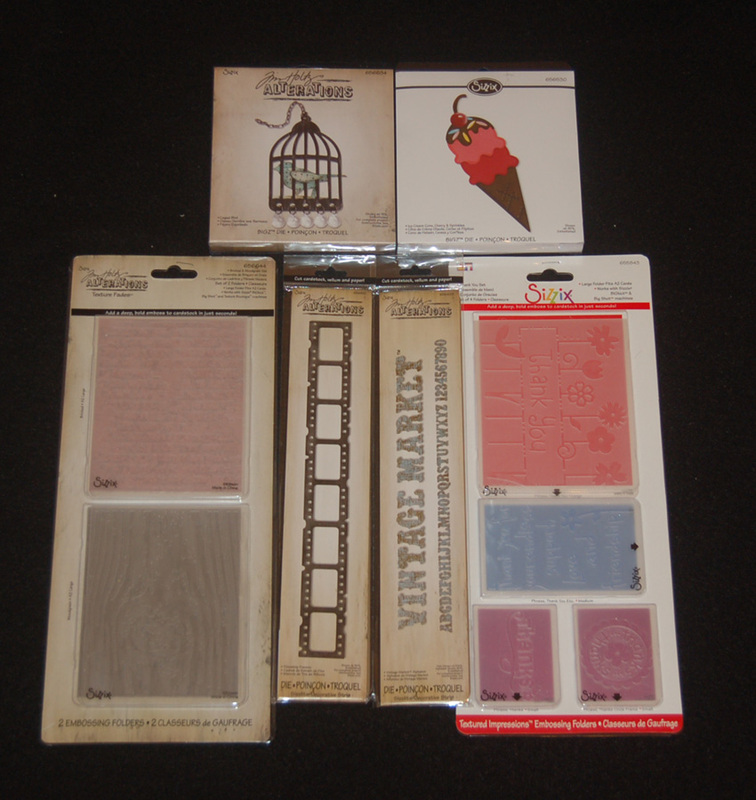 Tim Holtz is the product designer who is famous for his distress line of embossing powders, inks, dyes, stamps, etc. Paper crafters love his stuff because his products help to give a weathered look to their art. I chose the dies that can cut a bird cage, vintage letters, and filmstrips plus a texture folder set for woodgrain and bricks. There were other Tim Holtz Sizzix products I wanted (a coupon die and a matrix dot texture folder) but those will have to wait until my next shopping spree. There were other Sizzix products which might not be new but they were new to me. I found a useful Thank you texture plate set and a Birthday one too (but that one will have to wait). Now that there are so many sweet treat craft products available at Ben Franklin Crafts, I just know that I will use the ice cream cone Sizzix die often this summer. Okay, I've done more than enough shopping.....now I need gear up for some non-stop crafting. When I take a break I'll check out all the great blogs. Thanks to all of you who have recently joined my followers list....I just noticed you ! I'm a technically challenged crafter LOL! 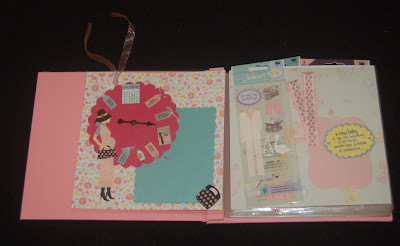 Isn't this an attractive line of 12x12 papers and embellishments? I found them at Ben Franklin Crafts and thought that they would make some great summery cards and alblum pages. They are products of TPC Studio and are available in lots of other ocean designs. My favorite embellishment in the line are the round shaker stickers with sequins inside. The paper that I found irresistible is the blue one that has little fish on it and shimmers when moved. Unfortunately, it didn't photograph well.....but IRL it's gorgeous! Because we live on an island, this line should be especially attractive to Hawaii crafters. Thank you for visiting this blog. I hope that you found it interesting and will return often to read about my crafting and shopping finds.